Welcome back everyone! Mindy here and today I’m sharing a card using a stamp from the new May 2018 release from Pink & Main! These are some absolutely gorgeous stamps in this release and some amazing new dies! I’m taking a piece of Neenah Desert Storm cardstock and prepping it with a powder tool to remove any oils or static. Then using my misti tool, I stamp this floral background onto my cardstock with Versamark ink and heat emboss with white embossing powder. Once cool, I use the stitched rectangle die to add the stitched frame border to it. Then I layer it with white cardstock and add to an A2 size cardbase made from Neenah Desert Storm cardstock. 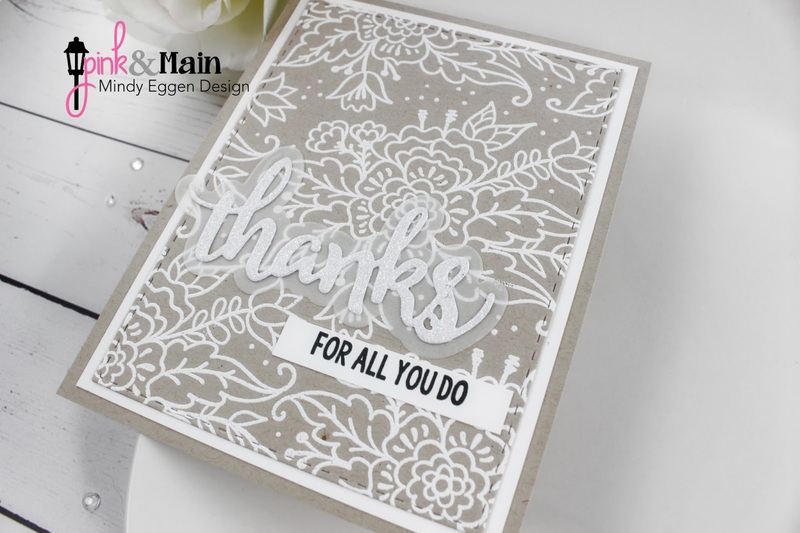 I cut the Thanks die from white glitter cardstock added to a vellum piece that I cut with the shadow die and added to the front of my card. I also stamped out this sentiment from the Thanks stamp set and added under my diecut piece. There are so many amazing stamps and dies in this release! I hope you check them out! This entry was posted in Cards and tagged designer Mindy, floral background, mindyeggendesign.